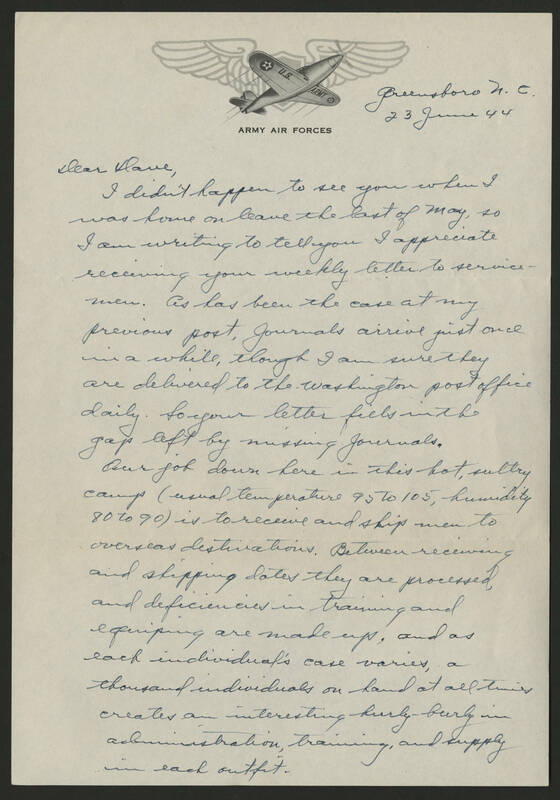 Greensboro N. C. 23 June 44 Dear Dave I didn't happen to see you when I was home on leave the last of May, so I am writing to tell you I appreciate receiving your weekly letter to servicemen. As has been the case at my previous post, journals arrive just once in a while, though I am sure they are delivered to the Washington post office daily. So your letter fills in the gap left by missing journals. Our job down here in this hot, sultry camp (usual temperature 95 to 105, humidity 80 to 90) is to receive and ship men to overseas destinations. Between receiving and shipping dates they are processed, and deficiencies in training and equiping are made up, and as each individual's case varies, a thousand individuals on hand at all times creates an interesting hurly-burly in administration, training, and supply in each outfit.